Beautiful You: Mini Series | What's On My iPhone! Mini Series | What's On My iPhone! It is Friday again which means that it is time for another instalment of the mini series! 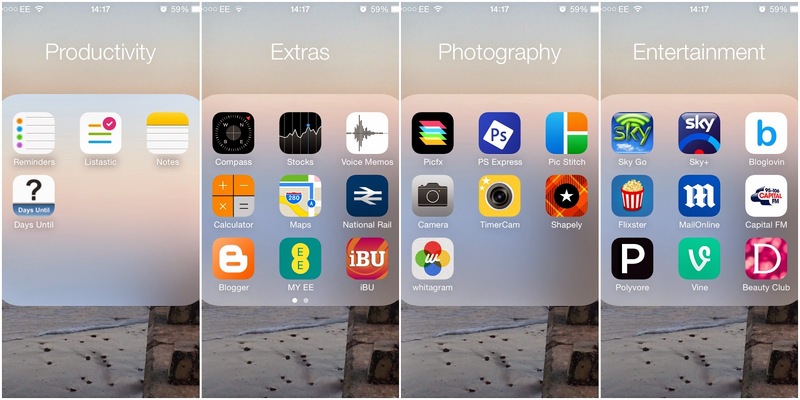 This week is 'What's On My iPhone/iPad' week so I will share with you guys the apps that I have on my iPhone and what I use some of them for. I hope you like getting an insight into what I have on my phone and maybe you go and download some of them, if you do let me know in the comments! Then I have a few folders on my home screen which I will zoom in and show you! The first one that I have is Productivity and in there I just have Reminders, Listastic, Notes and Days Until. I love this folder because I am obsessed with being organised and this really does help me do it, especially Listastic because it is really easy to cross of what you have done to keep everything in order! The next folder is Extras in here I have some of the apple apps (Compass, Stocks, Voice Memo, Calculator and Maps), the National Rail app, Blogger, my EE and iBU which is for my uni! The next folder on my home screen is Photography, in here I have the apps that I sometimes use to edit my instagram pictures, I have Picfx, PS Express, Pic Stitch, the actual camera app, TimerCam, Shapely and Whitagram; I love using this for when you take a picture in a different shape but you still want to put it on instagram! The last folder I have is Entertainment, in here I have Sky Go, Sky +, Bloglovin, Flixster, Mail Online, Capital FM, Polyvore, Vine and my Beauty Club Card (I have no idea why but it's in there!!). I am loving Vine so much right now, you can find some really funny things on there but my favourite people at the moment are Ben & Harley; he is the cutest! On the next page I only have two apps, I don't know why I didn't just add them to a folder on the next page but I'm used to it now. These are my fashion apps, Lookbook and What I Wore Today, I try my hardest to post on them regularly of what I've been wearing but I have been rubbish recently but if any of you have them go and follow me and I will get back into posting! Those are all of the apps that I currently have on my phone, the only new thing that I have downloaded is Timehop as I love seeing what I was doing 1/2/3/4 years ago, if you don't have it you need to download it! I hope you enjoyed this instalent of the series and don't forget to come back for next week as it is the last one! I hope you all have had good weeks and that you have fantastic weekends!